Get your hands on all of these products at this year’s Big One Show. There’s no doubting that it’s among the most vital items we carp anglers take fishing, be it for cooking a warming meal during a winter trip or for those all-important gallons of tea. It’s certainly one of the first things that gets packed in my carryall for any trip, regardless of whether I’m doing three nights or just a day – I’ll always need tea and, of course, may need to steam down shrink tubing or warm my tungsten putty. There are no shortage of options when it comes to buying a stove – albeit I’ve kept this buyer’s guide to gas versions. Although they can be more reliable in the cold, I find petrol stoves just too much hassle and I hate the smell of the fuel on my hands when I’m fishing! This has been my stove of choice for over a decade following a recommendation from Adam Penning. Other than replacing a worn-out Piezo igniter, it has been a titanic performer. It’s strength lies in the simplicity of design and quality components, for which Primus are world renowned. I’ve often said it, specialist manufacturers make the best specialist products and, while I can never claim to have tested or used every stove on the market, of those which I have this stands head and shoulders above the rest, albeit you pay a little extra for that quality and reliability. This clever design features twin heads which your gas cans screw directly into. This gives an impressive 3.8kw of power in each head, provided your gas bottle is relatively full. Brass control valves on each head allow for adjustment with a claimed 2min 30sec boil time on high. The clever bit is that each head is suspended on the main unit, raising the cooker up and making it far more comfortable compared to having to lean down over a ground-level unit. I’m sure many anglers will appreciate this, although you do need to take care not to knock it over! A 3.8kw output makes this one of the most powerful stoves out there, certainly in this kind of style at least. 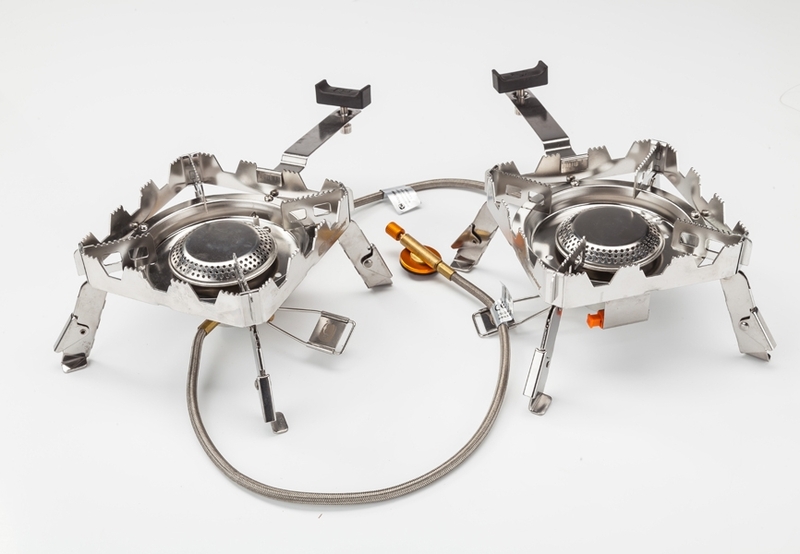 The spring-loaded legs and pan supports are easy to engage and create a low-lying stove that remains stable. I like the fact that the Piezo ignition is situated along the hose, towards the gas bottle, meaning you never have to have your hand anywhere near the head when lighting up. As with Primus, Coleman specialises in stove design and manufacturer so it’s no surprise that this one is so well made, efficient and easy to use. I particularly like the design of this stove, with the curved legs folding neatly around the head when in transit to create a super-compact package from a high-powered unit. An impressive 3.2kw of power from a well-filled butane/propane gas bottle provides a fast boil time, while the power is easily adjusted via the dial at the bottle end of the hose. A built-in Piezo ignition switch sits beneath the main body, making for relatively safe and easy lighting and the overall build quality feels reassuring solid. At 320grams it’s also light as well as compact. This one’s a terrific option for the angler on a budget – I’ve seen them for as little as £19.99 in many shops – but who wants more than a screw-on stove in their kit. Extremely light at just 260grams, the Rotary still boasts 3.2kw of power, while the simplicity of the leg design makes for quick set-up and use. While not as compact as some when stowed, the legs open wide and offer a steady foundation and low centre of gravity in use. A Piezo ignition and adjustable power dial at the end of the hose complete a simple but effective and great-value stove. RidgeMonkey’s square head also comes in this double version, with a flex connecting the two heads – which can be detached and used independently. A single gas bottle provides the fuel which passes into both heads. This can slow the boil time slightly on the second head, especially when your gas bottle is nearer empty than full. However, each head’s power can be adjusted so this is easily managed. 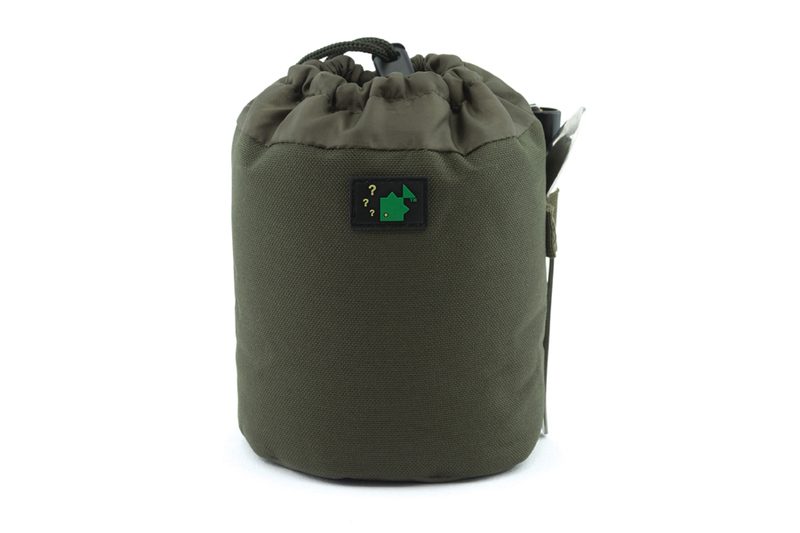 Ideal for keeping your gas bottle insulated in cold conditions (gas can be up to 80 per cent less effective when cold) as well as making your gas bottle a bit more ‘carpy’, the Thinking Anglers pouch even boasts a teaspoon holder! Housing a pair of mugs, storage pots, milk flask and teaspoon, there’s also room for a stove and gas canister, keeping everything safely stored together. Unique square design to fit perfectly on Ridgemonkey stoves, but will work on any. Soft touch, heat safe handles fold down for compact stowage.